…hope te leap second didn’t mess up all the servers! Author Dušan MulacPosted on 2017-01-01 2017-01-12 Categories OtherLeave a comment on Happy new year! How many registered vehicles are in Slovenia? What about different vehicle types? Since data entry is done at registration points by hand, you see “MERCEDES BENZ” and “MERCEDES-BENZ” etc. as different manufacturers. How many Lamborghinis (all vehicle types, all spellings)? Nice, 4 actual Lamborhini cars. What about some demographic data – how old are the owners (Starost == age)? In Slovenia it is legal for a minor to own or inherit a vehicle, but to register it, an adult “user” with the appropriate licence must be assigned. How many cars are registered per administrative unit (geographical)? What about fuel type (gasoline vs diesel vs others)? I will probably add more queries/results, when I get some new ideas and/or questions. Slovenian “National Interoperability Framework” (NIO) publishes some interesting data every now and then, but most data is usually in MS Access ‘mdb’ format and/or ‘csv’. Working with csv files is painful, since you have to do everything by hand (no selects, filters etc, you have to go through each and every line and check the conditions in a giant loop), and using Microsoft Access on Linux is an even bigger NO. So, i decided to download some data (anonymized data on drivers licences in Slovenia), and convert it from mdb to MySQL (and insert it into the database). I could have done the same with parsing the csv file, but doing it from mdb autogenerates the database schema, (with csv, you have to do that yourself, by hand). For converting the data i used mdbtools. The data i used can be found here (zipped mdb). The first thing after downloading and unzipping the data, was to check which (and how many) tables are inside – you can do this with the “mdb-tables” command. So, there is one table in the database named “Vozniki_2013” (old data, I know). -- Copyright (C) 2000-2011 Brian Bruns and others. -- the GPL, see COPYING.LIB and COPYING files respectively. Every field is “varchar (510)”, and that’s long. I’ve checked the data, and it fits into “varchar (50)”, so you can do a sed replace, to change the field size in the output. After that, you connect to the database, paste this output into the console (or pipe it directly from the command), and you will have an empty table created for your data. This would also be a good time to create any indexes you need. Now all we need is the actual data; we can get that using the “mdb-export” command (we have to tell it the table we want to export, and the output syntax). All you have to do now, is to redirect this to a file, and copy it to te server with the database, and import it (or pipe it directly, if you can use the MySQL client on the machine you’re using now). And voila, you have all the data in your MySQL database now. It just does a for loop over all shp files, and uses GDAL to merge them. This will create a merge.shp file with a layer named “merge” containing all the data from other shapefiles. PS: this works with shapefiles of the same type (eg. all polygon or all points). PPS: this is mostly a reminder for me, since i will probably forget the merge command, and I dont want to lose any more time googling it. Gkrellm2 is a “widget” that displays different system/etc. monitors at the side of the screen. It has keyboard shortcuts (PageUp and PageDown) to change the selected theme. So, if you change desktops and widow focus alot, it somethimes happens that gkrellm is focused by mistake, and by using the PageUp/Down keys, you change the theme when you didn’t want to. I have no idea why, but the key combination is hardcoded in src/gui.c. If you’re using gentoo. just put the file in /etc/portage/patches/app-admin/gkrellm and reemerge the package. 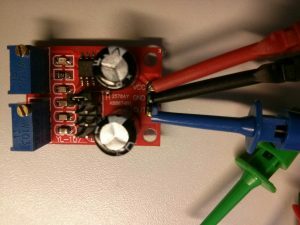 Recently I’ve found a cheap USB boost converter (small device that turns a lower voltage (~1V-5V) source to a regulated 5V output – so you can charge your USB devices from a range of batteries with different (lower) voltages). 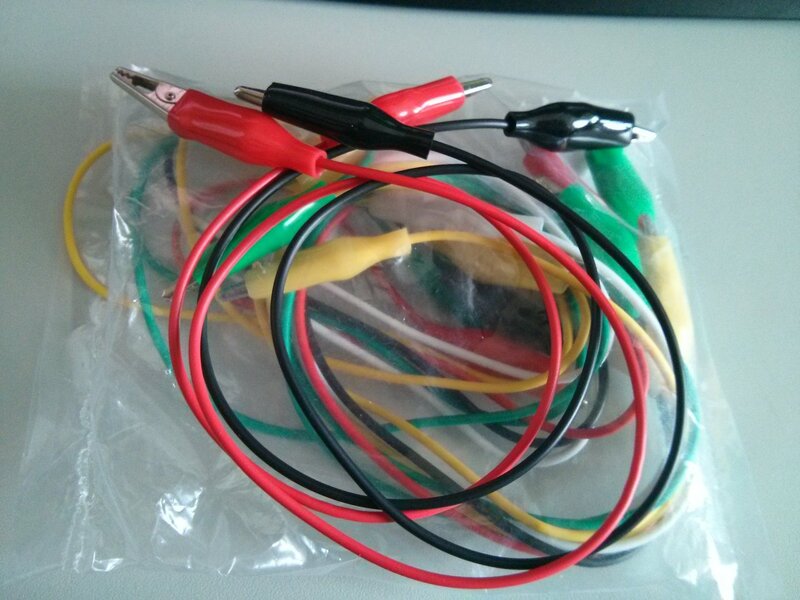 I’ve also received a pack of cables, with aligator clips on both ends, some time ago, so I’ve decided to use them instead of soldering/”improvising”. For input power, I’ve used a TrustFire 18650 battery in a holder, and the aligator clip cables to connect the boost converter. 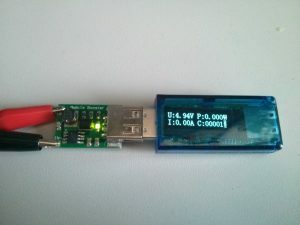 On the output, I’ve also connected a USB power meter to measure the output voltage and current (I wasn’t sure if it was the 500mA or 1A module). The voltage was 4.94 volts (somewhat low, but with such a small load, it could be the voltage regulator issue), and zero exit current. Everything is OK! Current was around 120mA (well below useful), and the output voltage was 4.68V (also too low). So ok, it’s a <$1 module, from eBay, probably no quality control whatsoever.. But just in case, let’s check the battery. I’ve connected a small 7segment LED display voltmeter to the boost module (under the clips), and nothing. The voltmeter requires ~3V to turn light up, so either it’s not working at all, or the voltage is too low. 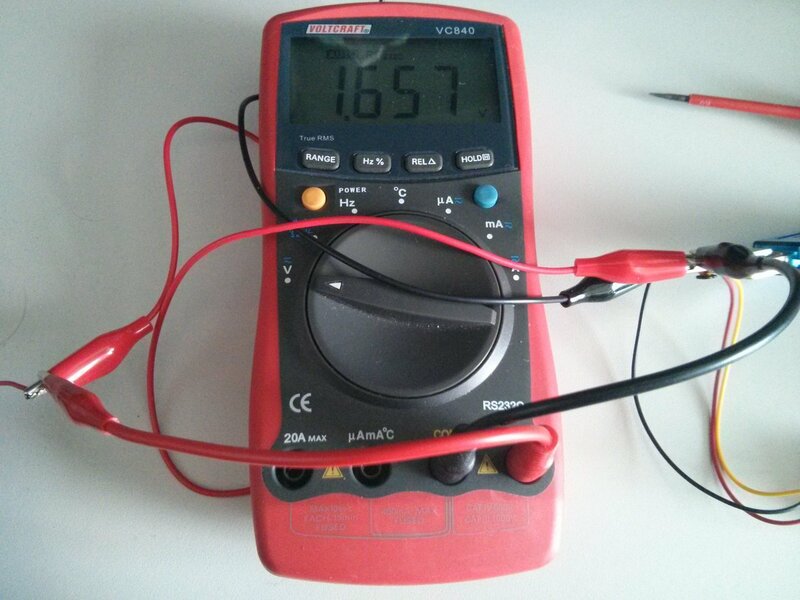 So I’ve used a proper multimeter, and measured the voltage of only 0.588 volts at the boost module! The batteries have protection circuits, so this isn’t a battery issue, since protection steps in at around 2.5 volts and shuts down the power completly. Voltage at the battery was around 3.8V when under load. Then I’ve touched the aligator clip cable with my hand (by accident), and it was warm to the touch – so here’s the problem! Next thing, I’ve measured the voltage drop on the cables, and was surprised by the results (well, not really that much, since the cables heating up quite a bit). The voltage drop on the red cable was 1.657 volts and 1.378 volts on the black cable. So, on a simple circuit with ~200mA of current, i was losing around 3 volts (~80% of the voltage) on the connecting cables. What have I learned today? Always check/verify which cheap Chinese manufacturer to blame, so you don’t blame the wrong one! After setting up my battery capacity tester, I’ve decided to do a test on a TrustFire 18650 lithium battery I’ve bought ~1.5 year ago on DealExtreme (url). The battery specs (and label) say it’s a 2400mAh battery, but with cheap chinese batteries, it’s better to measure then believe! The battery i have is not new, but has seen very little use (probably about 4-5 charge/discharge cycles), and has been fully charged (not good, I know) in a small battery box at room temperature for most of that time, so i was expecting some loss in capacity. I’ve charged the battery to full using a XTAR MP15 battery charger (USB power, very slow, but seems to work well), and started the discharge measurement immediately after the LED on the charger turned green (the battery should be at 95%+ capacity then, and the charger stays in CV mode for some time after that). And the results? 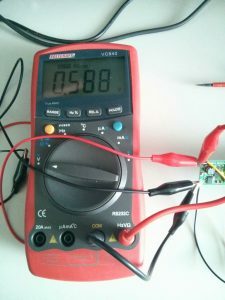 With a cutoff voltage of 3.0 volts (the protection circuit should kick in at about 2.5 volts, but I wasn’t willing to risk overdischarging it), the measured battery capacity was 2.271mAh! Which is great for that price! 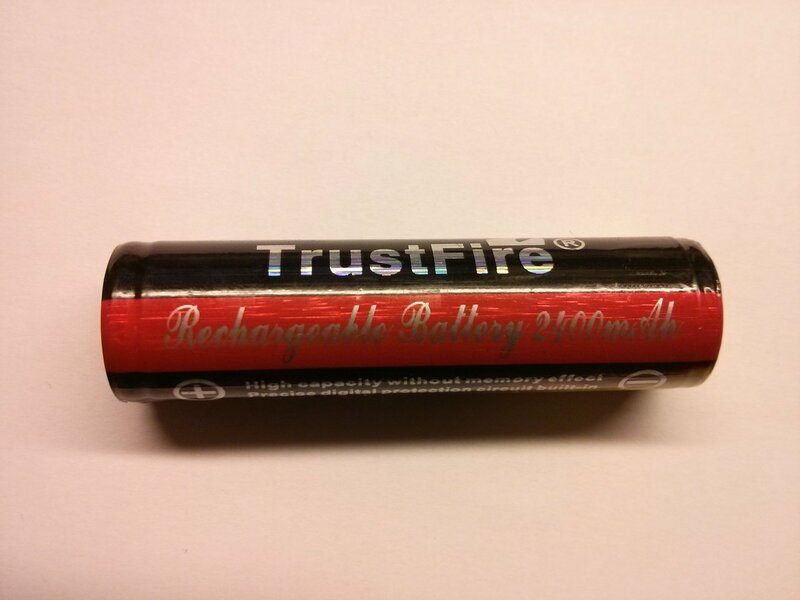 So now, on my TODO list: testing AA/AAA batteries, brand name vs. much cheaper, store branded ones. Recently, I’ve been browsing ebay for random electronics, and I’ve found a cheap ($4.33) battery capacity meter. Since it was below my $5 “I wont impulse-buy it, I’ll think about it”, i immediately ordered it. It came today, packed in bubble wrap, and contained a (micro) USB powered meter and a 5W 7.5Ohm load/resistor (measured 7.8Ohm at room temperature). On the left side are four terminals, outer two for the resistor and inner two for connecting the battery. In the middle is 4-digit 7-segment display, cutoff voltage adjustment buttons and three display leds, and on the right side is a micro USB connector, suppling power to the circuit. The microcontroller is probably hidden under the LED display. The meter is rated for 1.5-12V with a maximum load of 3.1A, so I’ve decided to try it out with a 18650 battery which should power a current of about 0.5A through the provided load. 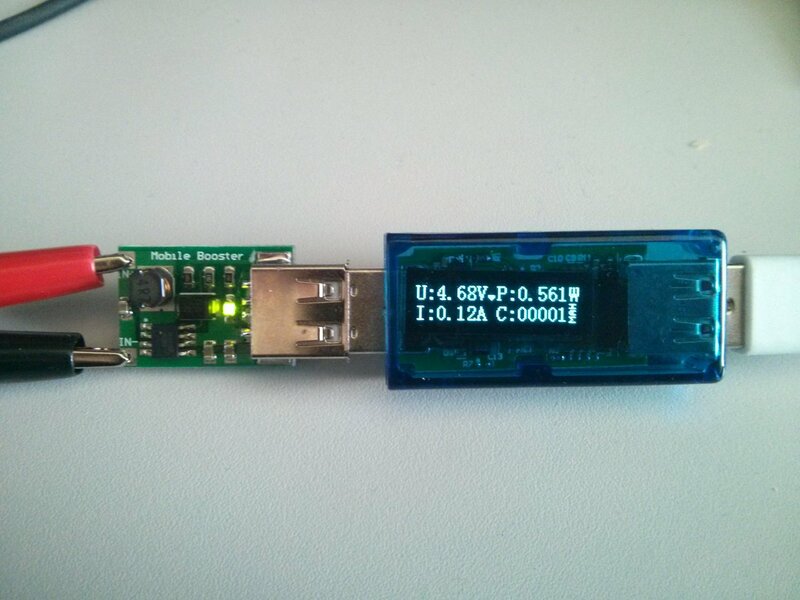 I’v also connected the load and the USB power connector. 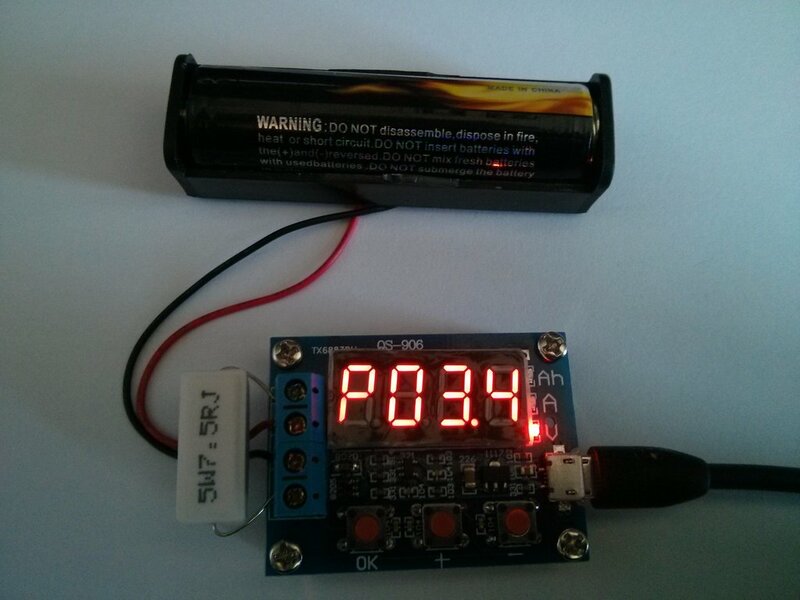 After powering on it showed the voltage of about 3.79V on the LED display. 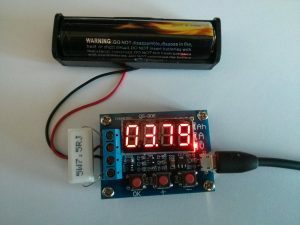 Using the (+) and (-) keys, you can adjust the cutoff voltage – this is the voltage when the battery is considered “empty”. Usually, most lithium cells have extra protection circuits, which cut off the power, when the cell voltage is too low, to prevent over-discharging – so you have to consider that when setting the voltage limit. Pressing OK starts the discharge process. The display loops between capacity (Ah), current (A) and voltage (V), and shows the current values. 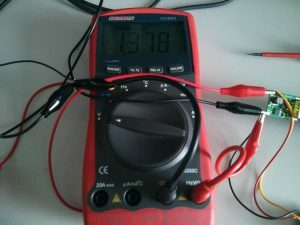 I’ve verified the values with my multimeter – the voltage was the same on both meters in all three digits, and the current differed only slightly with the last digit (<1mA difference compared to my multimeter). Warning: the resistor gets HOT (>100°C). I’ll probably replace it with something larger or add some heatsinks to it. I’ve tweaked the cutoff voltage (so I could see what happens when it’s finished measuring), and the display started flashing rapidly and stayed in the capacity display mode.